Four herds of plains bison totaling about 900 animals graze in Alaska. The American bison occurs in two subspecies in North America, the plains bison (Bison bison bison) and the wood bison (Bison bison athabascae). Plains bison are somewhat smaller than wood bison. A bison’s head and forequarters are massive and seem out of proportion to the smaller hindquarters. A bison’s backbone begins to rise just ahead of the hips and reaches its maximum height about or behind the front shoulder. From above the shoulder, the hump drops almost straight down to the neck. In wood bison, the hump is taller and the highest point of the hump is further forward than in plains bison. Bison have horns that curve upward. The horns of a bull are larger and heavier than the horns of a cow. In late fall, a bison’s coat is a rich, dark brown. As winter progresses, the coat changes color and is lighter colored by spring. When the weather warms, the hair loosens and hangs in patches until it is completely shed and replaced with new hair in the late spring. The hair on the chin resembles a goatee and is more pointed in wood bison. Older animals tend to have more hair on their heads. Most bison calves are born in May; however, they can be born from April to August or even later. Newborn calves have a reddish coat. They are able to stand when only 30 minutes old and within a few hours can run and kick their hind legs in the air. Calves start grazing at about 6 days of age, but they are not completely weaned until a few months later. Their reddish-orange coat begins to darken at about 10 weeks and turns dark brown about 5 weeks later. Cows are sexually mature at 2 years of age and give birth to a single calf in two out of three years on average, after a gestation period of about 9 months. Bison in Alaska have been known to live a relatively long time compared to other hoofed animals. One tagged bull in the Copper River area was over 20 years old. Various forms of bison existed in Alaska for several hundred thousand years; until relatively recent times, bison were one of the most abundant large animals on the landscape. Alaska’s existing wild plains bison are descendants of animals that were transplanted from Montana in 1928 to Delta Junction. Transplants have created additional herds at Copper River, Chitina River, and Farewell. Small domestic herds are located in agricultural areas on the mainland and on Kodiak and Popov Islands. Bison tend to remain in a home range, although they often move between seasonal ranges. Alaska’s wild bison do not remain in single herds, but occur alone or in groups ranging up to several hundred animals or more. In the Delta Junction area, they move up the Delta River in early spring to secluded meadows where they calve. This herd continues to move about in the area throughout the year. Alaska’s other wild bison herds also show seasonal movement patterns. During the Ice Age, steppe bison, the ancestors of modern bison, migrated into Alaska from Asia, crossing the Bering Land Corridor. Far larger than modern buffalo, with longer horns, these giant herbivores shared the tundra of prehistoric Alaska with wild horses, wooly mammoths, and western camels. As ice sheets advanced and retreated, the migratory bison dispersed across North America. Temporary advancements of glaciers isolated populations, and bison evolved into two subspecies, wood bison and the smaller plains bison. The giant longhorn steppe bison became extinct. Wood bison adapted to life in the north, grazing in the boreal meadows and forests of Alaska and Canada. The smaller plains bison thrived further south, and formed the famous buffalo herds of the American Great Plains. 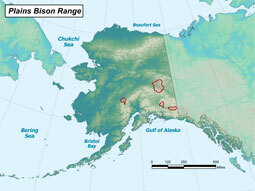 Wood bison disappeared from Alaska several hundred years ago, probably the result of hunting and changing habitat. At the time plains bison were introduced, it was not known that a small population of wood bison existed in Canada. State wildlife biologists are working to reintroduce these northern adapted giants to part of their former range in Alaska, and animals from the Canadian herd have been selected to pioneer this new Alaska herd. Four herds of plains bison totaling about 900 animals graze in Alaska. The largest herd is near Delta Junction, and smaller herds have been established by translocation from the Delta herd to Farewell, Chitina River, and the Copper River. The Delta herd ranges in the central Tanana Valley near the town of Delta Junction, and the management objective is to maintain a herd size of about 360 bison at the pre-calving count. The Copper River herd inhabits the area between the Dadina River and the Kotsina River in northern GMU 11. The Copper River herd originated from 17 animals taken from the Delta Herd in 1950. Over the years, the herd size has ranged from 51 bison in 1967 to a high of 143 in 2009. The first hunt for this herd was in 1964. Deep snow (resulting in winter mortality), as well as hunter harvest, controls the herd size. Harvest is under a drawing permit. Hunting was closed between 1989 and 1999 due to low numbers. Management objectives are to maintain a herd size of 60 overwintering animals. Harvest has been about eight animals/year (five year average, 2002-2007). About 24 permits are issued, out of about 1,100 applications. The Chitina River herd inhabits the area around the Chitina River from the confluence of the Tana River and the Chitina Glacier in GMU 11. 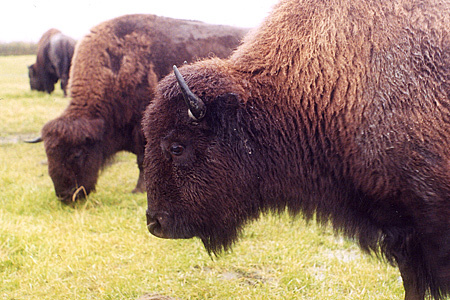 In 1962, 35 bison were translocated from the Delta herd. The herd grew to about 50 in 2003. A large die-off occurred in 2004 because of winter mortality and only 25 bison were observed the summer of 2005. The hunt was closed in 2004 and 2005 because of low numbers. Two bison were harvested in 2006, and hunting has been closed since then because of low numbers. The management objective is a minimum of 50 overwintering adult animals. The last count, in 2009, was 41 animals and the herd is slowly increasing. The Farewell herd inhabits the Farewell area of the drainages flowing into the Kuskokwim River in GMU 19C and 19D. It was established by a translocation of 18 animals from the Delta Bison Herd in 1965, supplemented by an additional transplant of 20 bison (also from the Delta Herd) in 1968. Harvest is managed by a drawing permit system. Between 10 and 80 permits were issued annually since hunting began in 1972, and annual harvest averaged about 20 animals. The management objective is to maintain a minimum population of 300 bison, allowing for an annual harvest of up to 40 bison. Bison habitat in the Farewell area is maintained by frequent fires. The herd grew over the years and numbered about 350 animals by the late 1990s. Then around 2000 bison numbers began declining, a 2007 survey counted 187 animals. The population most likely decreased because of a combination of declines in the quality of their fire driven habitat, and too much harvest of female bison. Harvest was reduced to 10 permits each year, and a big wildland fire in the area in 2010 rejuvenated the habitat and improved the quality of the forage. Numbers began increasing and the 2014 survey counted about 400 bison. Herds located in Delta Junction, Copper River, Chitina River, and Farewell. Herbivorous; bison graze on sedges, grasses, and sometimes willow and dwarf birch. Single calves are most common, but twinning can occur. Nearing extinction in the late 1800s, bison have bounced back and exist in Alaska in large numbers now.